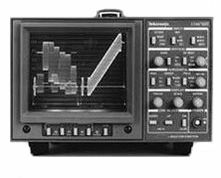 The Tektronix 1731 Waveform Monitors provide comprehensive television signal monitoring for both NTSC and PAL applications. This versatile instrument is a light weight, half-rack width and have bright CRTs for video signal monitoring. The 1731 exceed normal monitoring capabilities. This 1731 monitor has its own advanced feature set and the proven 1700 Series family performance to provide more monitor for the money. These monitors do the job faster, better and easier at an economical price.